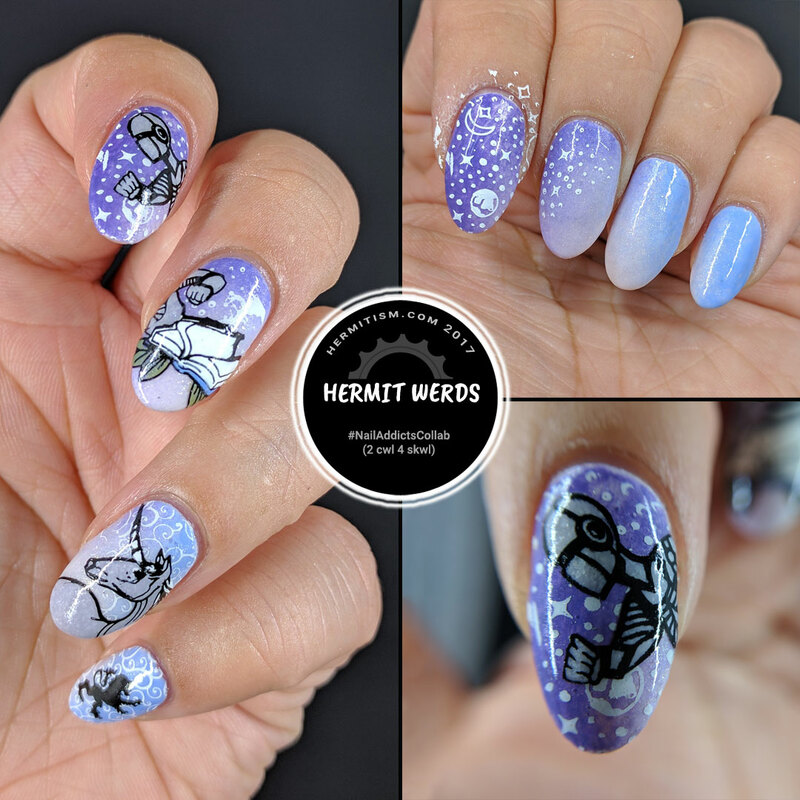 I really wanted to participate in this month’s #NailAddictsCollab. The theme was 2 Cwl 4 Skwl and since you’re supposed to include a bit about why you chose your subject, I really thought about what I wanted to say. At first I wanted to paint Bart Simpson nails because he definitly thinks he is too cool for school. But that wasn’t very personal. When I was in school I spent a large portion of my time in class reading other books. I did well enough grade-wise that I didn’t get my books taken away, but I probably should have read more non-fiction. Heh! 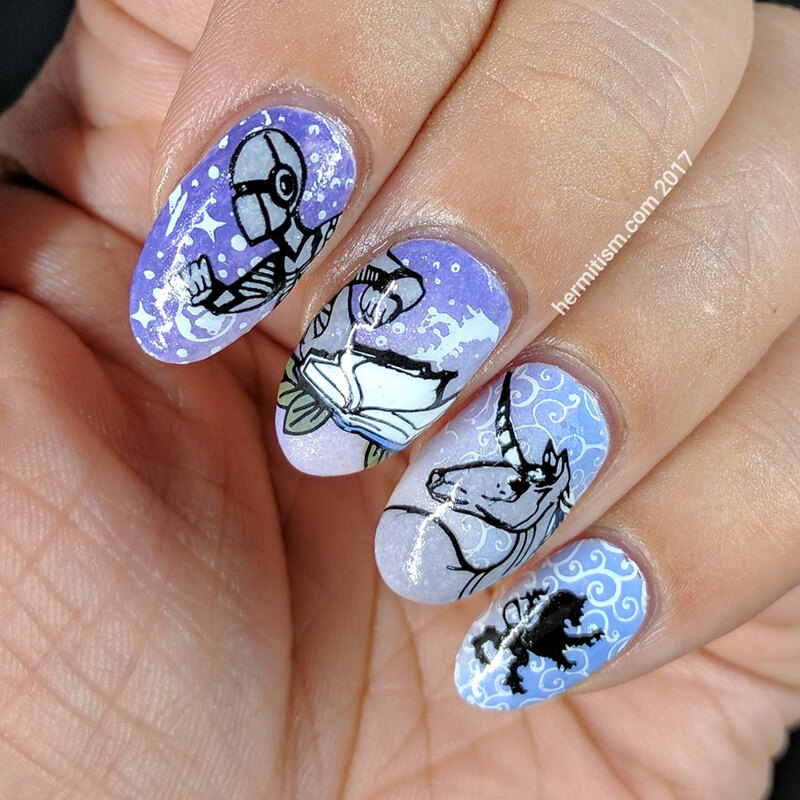 So these nails feature a book with science fiction and fantasy themes in the background because by the time I hit junior high, I knew what books I liked. Bujold and Asimov. Anne McCaffery’s dragons of Pern (arguably science fiction). Meredith Pierce’s Firebringer* series and one of my all-time favorites: Tamora Pierce’s Lioness series (really want to re-read both series soon). Sweet memories and so many good books. I’ve included more superhero and paranormal books to my line of usual reads these days, but I still get plenty of all. * Yes, I know Firebringer is not a grey unicorn. I laid down my lightest color first (North Star) and then cut a very thin square of sponge and angled in the gradient on either side. Then I stamped appropriate patterns in white and layered decals with black lines on top. I kept the color palette very simple and fairly de-saturated. I think I managed to keep it fairly cohesive despite how many different stamping plates (and brands) I used, although I wish I had some flowing unicorn mane to stick under the lion’s feet to help anchor her. Items being used for the first time are listed in italics. One of my favorites. 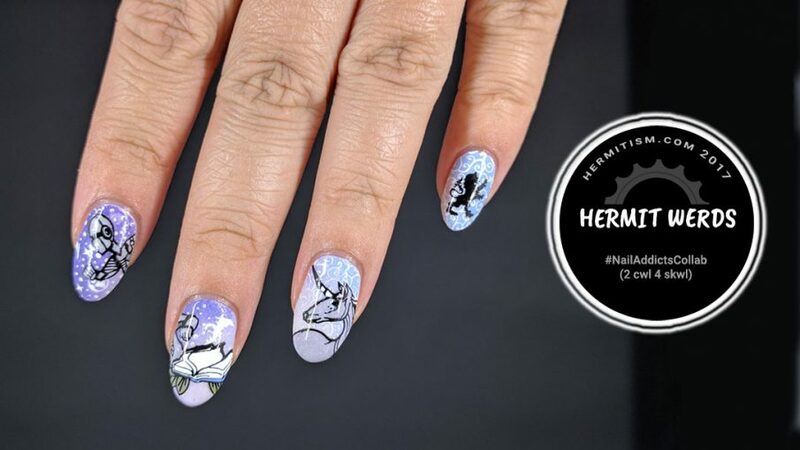 The color gradient, the cool background stamping, and the two-part nail stamp of the robot coming out of the book. YES!